Fashion exists within whisky. Producers aim to control trends and, if playing catch-up, they introduce a variety of releases that tap into the profile. Peat remains highly fashionable, especially anything from Islay. Bling is cool as well, sadly. Fancy tales and concepts also dominate the hit parade alongside the blockbuster brands like the Glenlivet, Glenfiddich and Macallan getting a bit edgy. Except very little changes. Jura with its new branding, as we discovered in our Jura Journey review, had not moved the goalposts, merely repainted them. Eventually, the same chips and scuffs will reappear and then what? Time for another great idea or lick of paint. Internally at MALT, we have team discussions. These mainly consist of Alexandra trying to bait me into a response or some argument as to who is the ultimate millennial hipster. Note for the record it seems Adam is in pole position. Fun exchanges that help keep things moving and a sense of unity. On occasion, we discuss possible features for the site or throw ideas out there and see how they’re received. Such an idea was the MALT league table. A handy guide for what distilleries were floating our boat or sinking deep beneath the waves, destined to hit rock bottom and in our opinion to be avoided. A modern-day ‘staff recommends’ page. Forget all these cool brand ambassadors instructing you how great Master Distiller Concept XXII is and why. Instead, the table would underline in our opinion what’s worth keeping an eye out for. If you missed an earlier review – easily done given our daily format – then it could be a useful resource. The whole dynamic has potential but needs work. It taps into the fashionable aspect and the sense of what’s current. All of which takes us onto the grotty distillery that is Ben Nevis. It’s not a looker or a charmer in the fashion stakes. Potentially it has a brand ambassador although the guilty party doesn’t spring to mind immediately. Then there’s the added baggage of being a not-so-fashionable Highland distillery. Ask a tasting or group of enthusiasts what’s their favourite whisky region and you can guarantee the top 3 almost 100% of the time. It’ll be Islay, Speyside and Campbeltown. Peat plays a part in this as does the approachability of Speyside and its iconic distilleries. Lowland will rarely feature as until relatively recently the region was only represented by Auchentoshan and Glenkinchie. The nightmare of the school team selection springs to mind where you didn’t want to be the last person picked due to your inept football skills. Please pick me, I don’t want to be last or in play in goals. Auchentoshan and Glenkinchie would be available until the bitter end. Trends are boring. Show me two routes and I’ll take the less travelled and more perilous journey. Ask me what is my favourite whisky region and the only answer will be the Highlands. Criminally overlooked and not as immediate as its countrymen, the Highlands with its rugged characteristics plays host to several divisive whiskies. The potential is huge if distilleries within this region capture the essence of their surroundings and dare to go it alone by giving us whiskies that enthral and challenge our comfortable existence. Ben Nevis sits on the outskirts of Fort William near the foot of the United Kingdom’s highest mountain. A challenging environment and for anyone seeking to reach the banks of Fort William the drive is often eventful and blessed with some of Scotland’s most stunning scenery. The town itself reflects the weathered distillery with its glory years very much behind it as a destination. The legacy is evident along the waterfront with Victorian buildings and impressive stone structures. Fort William much like Oban has seen better days. In total, the town has supported 3 distilleries during its existence with the Nevis departing in 1908 before being joined by the fabulous Glenlochy during the last whisky cull of the 1980’s. Whenever I think of the Highland region I picture Glenlochy with its red brick exterior that now houses residential accommodation. A rather difficult whisky that could literally be firewater or a more sublime and memorable experience. Now when I skirmish the outskirts of Fort William it is to turn north and head towards the Isle of Skye. 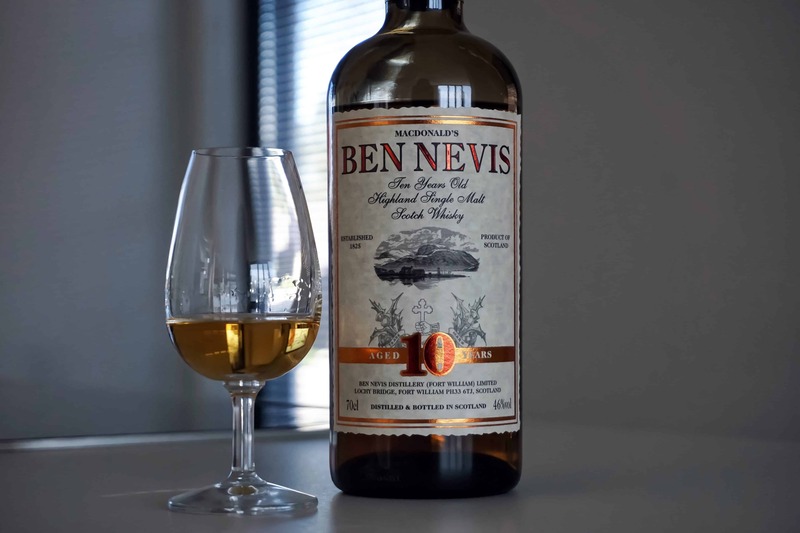 Its hacienda days long behind it, but thankfully the Ben Nevis distillery refuses to die. History shows us that the distillery has always been a bit of a renegade and content to do things its own way despite the rulebook of the Scotch Whisky Association. Take the ownership of Joseph Hobbs in the 1950’s who had a Coffey still installed so that the blending requirements could be more convenient. Going a step further they blended the distillate from all the stills prior to filling the casks. Presumably the reverse of what we see nowadays and removing the need for a Master Blender. Let’s not forget when the traditional Oregon pine washbacks were removed to only be replaced by concrete washbacks. Perhaps there’s something in the water prompting Ben Nevis to do things its own way? On the nose: poached pears with apples thrown in. A gentle and relaxing introduction with white grapes, bananas, jasmine, boiled mint sweets and icing sugar. There’s not much else in all honesty as its pleasant and inoffensive. In the mouth: more vanilla that combines well with the pear and apple influence. It’s fairly limited and here the grain aspect is more noticeable towards the end. Prior to this there’s elements of lemon, mango and green bananas on the finish. Bottled at 17 years of age from cask #1317 at 46% strength, with an outturn of 320 bottles originally retailing for circa £70. On the nose: very buttery almost olive oil with a lemon twist and more of the greenish features of the previous whisky. It needs time. Then the orange chocolate notes seep through. A little ginger, almonds, roasted coffee and pineapple cubes. There’s almost a herbal note coming through right at the death. In the mouth: pleasant, a touch of sweetness and smoke towards the finish. Refreshing. Very easy drinking but maybe not dynamic enough. Ripe pears, some banana, marzipan, white grapes and grapefruit. Perhaps snatched from the cask too early? Distilled in 1996 and bottled from cask #871, this produced just 86 bottles at £80 before selling out. On the nose: stewed apples, icing sugar, a melon quality followed by pine cones and a fresh croissant. Wine gums, lemon and barley drops bring a sweetness. There’s an encouraging level of detail. In the mouth: the complexity fails to land on the palate. It feels a little flat with lemon, overly ripe pears, sandalwood, candlewax and white chocolate. The Cadenhead release was distilled in 1996 before being bottled in 2017 at a strength of 51.1%. From a bourbon hogshead, this cask resulted in an outturn of 240 bottles. On the nose: fresh and vibrant, more youthful than you’d anticipate with citrus notes with mango, lemon, green olives and custard creams. Blackberries from the roadside, raw pastry dough and a raspberry sorbet take us in another direction. Speaking of which have you tried the cheddar cheese with apricots in it? A real crowd pleaser of a nose and not typical of this distillery. In the mouth: thankfully the engaging nature continues. Very fruity with some cask char and apricot jam. Vanilla is in the mix but restrained with the juicy pears, lemon, grapefruit and Kiwi fruit stepping forth. A delightful creamy finish as well. The jokingly dubbed 176th Anniversary bottling. An outturn of 174 bottles from a bourbon hogshead at 49.1% strength. On the nose: wine gums and coconut flakes with syrup. Then there’s fennel, apple juice, honeycomb and a twist of lime. More caramel comes through after time and a resinous feature alongside a stewed black tea. In the mouth: pine cones and more of that resin. A touch of vanilla that moves aside for the lime and coffee beans on the finish. Bottled at 10 years of age from cask #334 at a strength of 56.4% that produced a stonking outturn of 710 bottles. 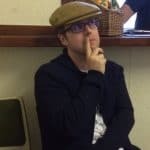 Long gone sadly – will I regret not purchasing one? On the nose: in a word rich. Quite ferocious initially. Tobacco, leather, red grapes, cranberries, apricot jam and hazelnuts. It’s fruity, with a certain dryness as well. Pecan pie, rhubarb and coffee beans. Maybe a flash of sulphur. In the mouth: less defined and rugged but still pleasurable. It’s a melting pot of the above aromas with little hitting the headlines. I like it a lot though. Strawberry laces, walnuts, dark chocolate and damp wood. Cloves, ginger, aniseed and liquorice. The Dew of Ben Nevis is entry level stuff, easy drinking and inoffensive. There is a lightness and simplicity that you wouldn’t normally associate with a Highland of whisky. Circa £29, I can think of whiskies that offer more at this price point or just go up a little more for the excellent 10 year old single malt. Both of the enjoyable Cadenhead releases are sister casks with the 176th edition requiring a little more work to appreciate fully. The remaining independent bottlings are solid enough without reaching such heights. Whilst the White Port is an oddity and a whisky that rewards patience and a playful inquisitive nature. Overall, a solid selection and an assortment that holds promise. You’re left thinking about buying more of the official 10 year old whilst you can. Last month I managed to drop by Fort William on my way to the Isle of Skye specifically to visit the Ben Nevis distillery on..